Pest control is an essential form of garden maintenance. You invest a lot of time and effort into making your yard beautiful, so it's frustrating when pests strike. By following a few basic guidelines, you can outsmart critters, insects, and other pests that might invade. Prevention should be the focus of your garden pest control strategy. Start by selecting plants that are appropriate for your growing conditions. Keep your plants healthy, so they are able to withstand occasional outbreaks. The first step in preventing pest and disease problems is to select healthy, pest-free plants. Also, choose plants that are well-adapted to your area. Native plants are excellent choices because they are naturally adapted to the local climate and soil type and have co-evolved in balance with native insects. Look for disease resistant cultivars when selecting plants. Catalog descriptions and plant ID tags at nurseries often contain disease-resistance information. For example, a tomato listed as "VFNT" is resistant to verticillium, fusarium, nematodes, and tobacco mosaic virus. In general, heirloom flower and vegetable varieties have excellent disease resistance. To discourage plant-specific pests from building up in the soil, plant your annual flowers and vegetables in different areas of the garden each year. There are many crop rotation schemes, but a basic rotation is to avoid growing the same crop or its relatives in the same place for at least 4 years. This means not just replanting disease-prone tomatoes in the same place, but also avoiding the other vegetables in the nightshade family that are susceptible to many of the same pathogens - potatoes, eggplant and peppers, for example. Avoid over- or under-watering, as excessively wet or dry soil weakens most plants, leaving them vulnerable to pests. Also, try to apply water the surface of the soil directly since overhead watering creates a more humid environment in the garden which encourages fungal disease. Drip irrigation systems are designed just for this purpose. Space plants adequately. Sufficient sunlight and air circulation helps discourage diseases such as powdery mildew. Mulch your garden to keep the soil cool and moist. This helps to discourage disease by preventing soil - and any pathogens harbored in it - from splashing up onto plants' leaves during heavy rains. At the same time, a deep layer of mulch inhibits weeds and adds nutrients to the soil, helping to create a healthy garden ecosystem. Prune away dead, broken, diseased or infested plant parts, using sharp, clean tools. Disinfect pruners with hydrogen peroxide or bleach in between cuts and put pest-infested or diseased materials in the trash. If pests strike, there are many simple solutions for controlling them. But before you reach for a chemical spray, consider safer alternatives. John Harrison of Espoma, a leading manufacturer of natural lawn and garden products, explains that "Synthetic pesticides persist in the environment and can run off into ground waters, lakes and streams. These materials can then enter into the food chain, potentially harming nearby animals and people." It's also important to realize that not all of the insects in your garden are pests; many of the bugs in your yard are beneficial and prey on other insects. When you use an insecticidal spray, you kill the good bugs along with the bad. According to Harrison, the good thing about natural pesticides is they "typically do not persist in the environment. This means when applied they simply do the job and then degrade into harmless, inert compounds." Handpicking is an effective option for slow-moving pests like caterpillars, snails, and Colorado potato beetles. Squash the bugs or drop them into a pail of soapy water - don't just toss them into the bushes where they can come right back. 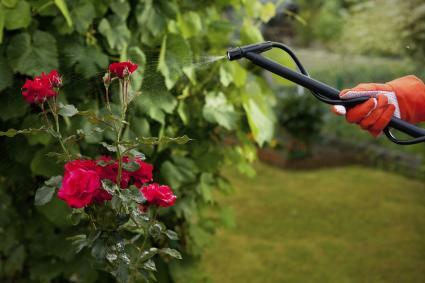 Knock off soft-bodied bugs - like aphids, leafhoppers and spider mites - with a forceful hose spray. Capture nocturnal pests such as slugs in homemade traps. Sink containers into your garden near damaged plants, fill them with beer, and wait for the slugs to come. Traps baited with synthetic pheromones can control pests such as coddling moths and apple maggots. Many of these traps are available in garden centers. Take steps to attract beneficial insects into your garden, such as ladybugs and praying mantis, which eat aphids and other pests. The key to this is having flowering herbaceous plants spread throughout garden, also known as insectaries. Use beneficial bacteria and nematodes to attack specific pests. You can purchase bacterial insecticides, such as BT, to target insects like caterpillars and Colorado potato beetle. Beneficial nematodes, which target problems in the soil, are also available. If these approaches fail and pests spread, a more aggressive approach is in order. "Next generation natural products have become available that can deliver control results that equal or sometimes better their synthetic counterparts," Harrison said. "Insecticidal soaps work by dehydrating soft-bodied insects," Harrison said. They can effectively control aphids, leafhoppers, thrips, scales, mealy bugs, and other common garden pests. Insecticidal soaps are non-toxic to people and pets but will harm beneficial insects, so use them carefully. You can buy insecticidal soaps or make your own: mix 1 to 3 teaspoons liquid dish soap with one gallon of water. A variety of horticultural oils can be used to smother and kill insects, as well as their eggs. "Oils like canola will smother insect eggs to prevent them from hatching," Harrison said. Make sure to follow the instructions on the label, because timing is important and some plants are sensitive to oil sprays. Botanical pesticides are derived from plants. Examples include pyrethrin, neem oil, rotenone, and citrus oils. Botanical pesticides break down quickly in the environment but are non-selective insect killers and can be harmful to people and animals. Use sparingly and always follow label directions. Harrison recommends products containing "a natural extract from chrysanthemum flowers that disrupts the pest's nervous system." Homemade remedies using natural ingredients like garlic, hot pepper, soap and oils have proved themselves as useful pest controls for many gardeners. There are numerous recipes available. To make garlic oil, soak 3 ounces minced garlic in 2 tablespoons mineral oil for 24 hours; strain; add 1 pint water and 1 teaspoon liquid dish soap. Spray plants with 1 to 2 tablespoons of this mixture dissolved in 1 pint of water. A soap and oil spray can be made by mixing 1 tablespoon dish soap with 1 cup vegetable oil. Mix 1 to 2 ½ teaspoons of this mixture into one cup of water. Numerous animals can also threaten your beloved plants. Again, prevention is the best control. 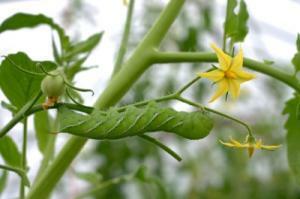 Try growing plants the critters don't like to eat. For example, if you have bad luck with tulips, try daffodils, scilla, or fritillaria. Deer, rabbits, and other rodents tend to leave those bulbs alone. Install fences or barriers around your plants. In areas where gophers and ground squirrels are present, use chicken wire or hardware cloth to line planting holes - or an entire bed, in the case of annual flowers and vegetables - to prevent the critters from chewing on or disturbing the roots. Some gardeners have luck deterring mammalian pests with products such as blood meal or sprays made of hot pepper, garlic, and other foul-smelling ingredients. Many are commercially available, but you'll have to experiment to see what works for you. Remember that some animals such as birds, bats and toads help by eating harmful insects. If birds are eating your fruit before you can, drape netting around your fruit trees and bushes. 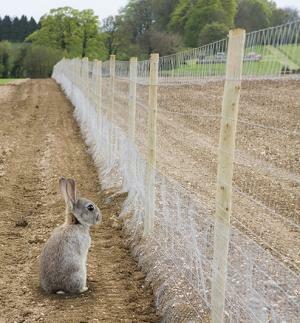 You can also use netting to stop birds from eating new seedlings in your lawn or garden. Learn to tolerate minor damage from pests and disease. Gardens are always changing. Seasonal weather changes or predation by birds and beneficial insects often takes care of pest problems before they get out of hand.